Matthew and Megan Krugger on their Mistletoe Acres Tree Farm in East Bridgewater. Megan Krugger teaches middle school science, her husband, Matthew, has a construction company, and on the side they’re growing about 7,000 Christmas trees on their Mistletoe Acres Tree Farm in East Bridgewater. The budding business is one of about 400 farms in Massachusetts -- mostly in the western and central parts of the state but also in places like Canton, Carver, Duxbury, Foxborough, Framingham, Haverhill, Lexington, Merrimac, and Stoneham -- that grow Christmas trees for the fresh-cut market, according to the latest state data. The number has grown steadily in recent years, up from 284 farms in 2007. “We have farmers making a living selling Christmas trees, farmers doing it more as part-time, and retirees who have acreage and are selling trees as more or less a pastime,” said Jim Colburn, secretary of the Massachusetts Christmas Tree Association, who counts himself among the latter. Becoming a Christmas tree farmer requires patience and an aptitude for taking the long view. Depending on the weather, most Christmas trees grow about a foot a year, Colburn said. That translates to a decade of work before a 10-foot tree makes it off the lot. Colburn, a retired certified public accountant, and his wife, a retired teacher, have been growing trees on their MerriHill Tree Farm in Merrimac for the last 13 years. But this is just the fifth year they’ve been selling them. This past summer’s drought put the kibosh on most Christmas tree farmers’ long-term plans, he said, with many of the youngest trees dying. Colburn said he lost almost all of the 600 seedlings he planted in the spring. “That’s very unusual; typically it’s less than 5 percent that don’t make it,” he said. Weather isn’t the only challenge for Christmas tree farmers. Insects, disease, mice, rabbits, voles, and deer take a toll, with the occasional young buck rubbing its antlers on a nice-sized tree and knocking off half the branches. Like most Massachusetts Christmas tree growers, Colburn buys his young stock from nurseries out of state. He gets his primarily from Pennsylvania and West Virginia; other farmers buy from wholesalers in Indiana, Michigan, Maine, New Hampshire, Vermont, the Carolinas, Canada, or the Tennessee Department of Agriculture, which was selling year-old, two-inch-tall Virginia pines this past spring. The seedlings cost anywhere from 10 cents to $1.50 each, depending on quantity, size, and variety, according to Mike Casto, who’s managed the family Houde’s Christmas Tree Farm in Marlborough with his wife, Sheila, since 2006. Houde’s Christmas Tree Farm grows about 10 types of spruces, firs, and pines. Casto said he plants a few thousand seedlings every spring, when the ground thaws, in the spots where older trees had been, giving each about five feet of space in all directions. Work continues year-round, with trees trimmed in the summer into classic “Christmas tree” shape, and then stumps removed and brush and weeds cleared in the fall. In the winter, trees are cut and sold, and the whole process begins again. “It’s hard to say how many we sell,” Casto said. “It ebbs and flows. It depends on the weather, it depends on the number of weekends” between Thanksgiving and Christmas, when people are more likely to be shopping for trees. “If you get a rainy or snowy weekend, it can be crushing for you,” he said. Prices at fresh-cut outlets also vary, with some farmers charging by the foot -- often $8 to $10 per -- and others by the tree or variety, Colburn said. Customers also vary, with some arriving “in a snowstorm with their best shoes on” and others ready to spend the day in the woods, he said. As far as caring for cut trees, Colburn said most will last through New Year’s if they’re kept watered and away from a heat source. Colburn said the most popular trees are balsam and Frazer firs. People with lots of heavy ornaments often opt for sturdy trees like the Serbian spruce. “Some people like fat trees, some like thin trees,” said Beverly Westerveld, who 10 years ago bought Tree Berry Farm in Scituate from her father, who planted his first trees there in 1974. “Some people look for a tree with a little character, some people want a perfect tree, others want a bargain. “Last year, we had a spruce we had to refund because it was so wide that four people could not push it through the door into the house,” she said. Megan Krugger hopes that won’t be a problem with the Canaan fir from her Mistletoe Acres Tree Farm that was cut as part of the state’s declaration of Green Friday. She said she plans to donate the fragrant six-footer to a needy family in her town. She and her husband had no experience in farming when they bought their home, in 2012, which just happened to have a Christmas tree farm on it. 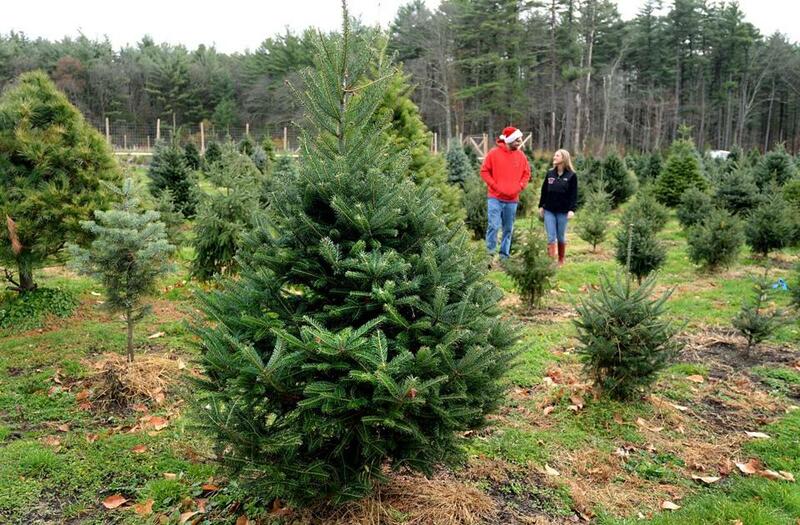 A map of Christmas tree farms in Massachusetts is available at www.christmas-trees.org/retailers-county.htm.